BEIJING, March 25 (Xinhua) -- The People's Liberation Army (PLA) Air Force recently conducted a high-sea training mission in the West Pacific and a joint combat patrol mission in the South China Sea, an air force spokesperson confirmed Sunday. 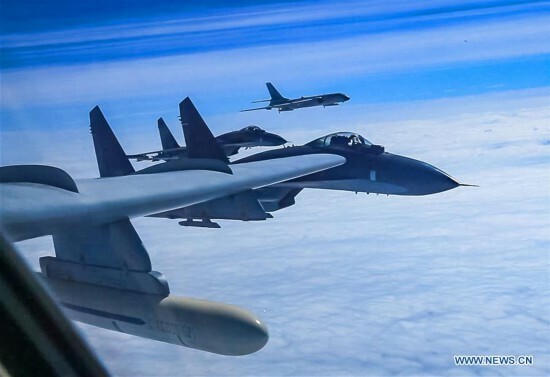 Shen Jinke, spokesperson for the PLA Air Force, said a formation, including H-6K bombers and Su-30 fighters, carried out a real combat training mission in the West Pacific via the Miyako Strait. The training aimed to improve high-sea combat ability, and was in line with international law and practice, he said. The PLA Air Force has sent another team consisting of combat aircraft,including H-6K bombers and Su-35 fighter jets, for a joint combat patrol mission in the South China Sea area, according to Shen. Shen said that the Su-35 fighter jets carrying out real combat training will enable the air force to improve real combat capability under long-distance and high-sea conditions. The PLA Air Force will continue to safeguard national sovereignty and security, as well as support the country's peaceful development through high-sea training and combat patrol missions, according to Shen.